After last week’s focus on using pen & paper alongside digital tools, I had a few people ask me questions about how I journal. Rather than repeat myself over several emails, I thought I’d answer those here. I would love to know more about your Journaling process. Do you journal in a notebook? Is it everyday? What time during the day do you journal? What’s the format of your journaling? There have been other people asking questions, but they mostly fall under the categories listed in the questions here. First of all, I do all my journalling in Day One. I love my pen and paper, but I do not love the activity of writing by hand. My notebook usage tends to be purposeful layouts (i.e. my habit tracker), regular templates (i.e. my weekly plan), and quickly scribbled lists. I enjoy tracking things on paper, but not writing. So journalling happens in Day One. Do I journal every day? Yes, and no. Yes, something goes into Day One every day. But no, I do not sit down and record the thoughts or events of each and every day. My perception that when most people think of journalling, they think of a diary type of resource where the activity is recording your feelings, thoughts, events of life, and plans for the future. I only use my journal in this way occasionally. Personal: This is the type of journal I refer to above, the common way of thinking of journalling. Here I include my thoughts on life, plans I’m considering, pictures of our kids and records of the memorable events in their lives, my weekly reviews, and completed home maintenance tasks. Reading: Day One is also a commonplace book for me as well as a place to track my thoughts and feelings. I’ve written about this for The Sweet Setup, but in short I have various IFTTT recipes that grab information from other sources and add entries to Day One. 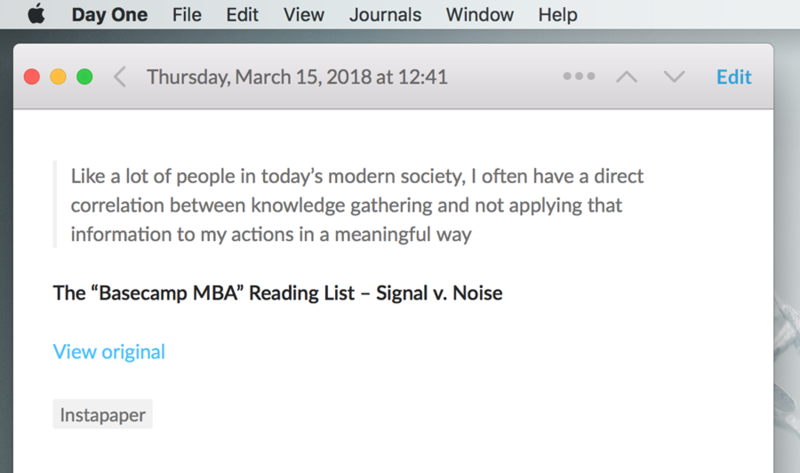 A good example is my highlights from Instapaper: when I highlight a passage in an article there, it gets automatically saved as a new entry in my reading journal. When I sit down to write an issue of this newsletter, I review that journal to find a quote of the week. Reports: This one is something I’m considering of removing. I have more IFTTT recipes that grab entries from RescueTime and Strava and add them as an entry in this journal. But I do not find myself valuing these entries and am considering deleting this entirely. Or focusing on my runs and removing the rest. Wildbit: Last, I track my work activities here. This is one journal that is regular: I have a daily recurring task called Complete Shutdown Routine. A big part of that is recording what I accomplished through the day. I don’t get to it every single workday, but it’s pretty consistent. These entries are not long — just one or two lines to summarize the day, then a bulleted list of what I did. Occasionally, I’ll add thoughts on why I did something so I can later recall the thinking that led to a decision. Again, my entries for the Personal journal are irregular and I do not use templates. In this area, I journal spontaneously when the notion strikes. However, it is something I would prefer to do more regularly. And so it’s also one of the items I include on my monthly habit tracker. But the Bible Study and Wildbit journals receive regular entries. The Reading and Runs journals receive updates automatically when I have time to read or run (or when I’m not dealing with an injury). So there is some automation, some entries are almost exclusively added on macOS (Wildbit entries), and some almost exclusively on iOS (Bible Study). However, reviewing and reading entries happens almost completely on iOS. I have a couple of recurring tasks to review certain things in Day One quarterly. And one of my favourite aspects of Day One is “On this day”. Once per day, the iOS version of the app shows a banner that takes me to all the entries that were created on a specific day. One last thought. Rian asked about templates, and I mentioned I do not use them. However, my notebook and weekly plan are a similar use case. Every week I list out one piece of Scripture to focus on, my goals, but also my wins, lessons learned, and things I’m thankful for over the previous week. Once completed, I snap a picture of this page and add it to an entry in my Personal journal. That is a bit of the more traditional journaling people think of. Just in a different format. And that’s what is great about the habit — we have a lot of amazing tools that give us flexibility.